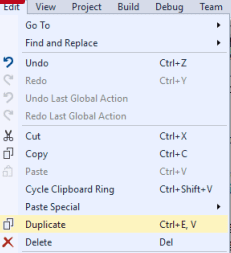 Is there a shortcut for Duplicate Line command in Visual Studio 2008? See this reference for more information. As @cand mentioned, you can just do Ctrl + C ; Ctrl + V.
Ctrl + C will copy the line if nothing is selected. There's a free extension you can download here that lets you duplicate lines without replacing the clipboard contents. By default its bound to Alt + D, but you can change it to anything you want by going to Tools->Options->Environment->Keyboard. Type "Duplicate" in the search box and look for "Edit.DuplicateSelection" and edit the shortcut to whatever you want. I prefer Ctrl + D to be consistent with other editors. It's simple Ctrl + C ; Ctrl + V , check this link. As long as you don't select any text, this will duplicate the line the cursor is over when you press Ctrl+C. Ctrl + C + V works for me on VS2012 with no extension. Ctrl + D works for me in VS2012 with Resharper. It's Resharper's hot key. behaves for lines starting with "///"
Why so many long drawn out methods to accomplish something so simple? It takes less than a minute to download and install the extension from Microsoft. The page says that it will bind it to ALT+D by default, but for me it bound it to CTRL+D automatically in Visual Studio Community 2015 without any changes. Here's the link to download the extension from Microsoft.com. While I realize this is not a keyboard shortcut, I figured I would add this, as it does not require the usage of the clipboard and might help some people. Highlight the row you want to duplicate. Press control, mouse click the highlighted text, and drag to where you want to go to. It will duplicate the highlighted text. As I can't use Macros in my Visual Studio 2013 I found a Visual Studio Plugin (I use it in 2012 and 2013). Duplicate Selection duplicates selections and whole Lines - they only need to be partial selected. The standard shortcut is ALT + D.
I've been using the macro that Wael posted: Duplicate line command for Visual Studio, but it stopped working a week ago, I assumed because of a Windows update. And I was correct, as of February 2014, Macros have been disabled in VS2010 (and 2008 apparently). To fix this you'll either have to uninstall the security updates, or add one line of code into the config files as shown here. You MUST run your text editor with admin rights or it won't work! Hopefully this helps anyone else who suddenly has their macro functionality pulled out from underneath them. Now go into Tools > Options > Keyboard, and type "Duplicate" in the search box (the full command string is "Edit.DuplicateSelection"). Here you can bind it to any shortcut in the same way you would for any other command. In Visual Studio 2010 you copy the entire line the cursor is on with CTRL + INSERT then you can use Ctrl + V or SHIFT + INSERT to paste it. VS 2017 its Ctrl + D or Ctrl + C ; Ctrl + V they both work for me. The command you want is Edit.Duplicate. It is mapped to CtrlE, CtrlV. This will not overwrite your clipboard. I use application link:AutoHotkey with below code saved in CommentDuplikateSaveClipboard.ahk file. You can edit/remove shortcuts it is easy. I have link to this file "Shortcut to CommentDuplikateSaveClipboard.ahk" in Autostart in windows. This script protect your clipboard. If you are more curious you would add shortcuts to thisable/enable script. I sometimes use very impressive Multi Clipboard script to easy handle with many clips saved on disk and use with CTRL+C,X,V to copy,paste,cut,next,previous,delete this,delete all. Ctrl + D will duplicate the line the cursor is in and insert it right below the line in focus. If you’d like to duplicate a specific set of code, simply select the portion of code you want to duplicate before invoking the duplicate code command. Not an answer, just a useful addition: As a freebie, I just invented (well... ehm... adjusted the code posted by Lolo) a RemoveLineOrBlock macro. Enjoy! Click on the line you want to copy. Ctrl + C will copy that line. Then simply use Ctrl + V to paste the line. Not the answer you're looking for? Browse other questions tagged visual-studio visual-studio-2008 keyboard-shortcuts or ask your own question. How to search for file names in Visual Studio?